Blue-white Rigel, in the constellation Orion, is one of the brightest stars in the night sky. It’s about twice as hot, and 40,000 times brighter, than our sun. The beautiful blue-white star Rigel is in the constellation Orion the Hunter. This constellation is one of the easiest-to-spot of all star patterns, and Rigel is one of the brightest stars in the night sky. Follow the links below to learn more about the star Rigel. How to see star Rigel in constellation Orion. Rigel in history and mythology. How to see star Rigel in constellation Orion. The star Rigel is easy to spot, in part because it’s so bright and also because of its distinctive blue-white color. Plus this star graces a lower corner of one of the sky’s most distinctive constellations, Orion the Hunter. You can catch Orion in the east before dawn in late summer, but on January evenings Orion is riding at its highest in the mid-evening sky. Look for Orion high in the south on these Northern Hemisphere winter evenings. 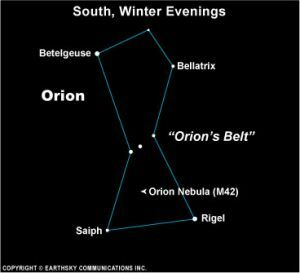 By early March, Orion – with blue-white Rigel in its midst – is high in the south as soon as the sun sets. By early May, it is setting before the sky has a chance to get really dark. To find Rigel, look first for its constellation Orion. You’ll look first for three stars in a short, straight line. These stars mark Orion’s Belt. A line drawn downward at a right or 90-degree angle from Orion’s Belt takes you to Rigel. For comparison, draw the line upward and you come to Betelgeuse, with a distinctive orangish tinge. Do not confuse Rigel with Sirius, which is farther to the east and farther south. Sirius is similar in appearance, but significantly brighter than Rigel. Science of star Rigel. We could not live as close to Rigel as we do to our sun, because its surface temperature is much hotter, about 19,000 degrees F (11,000K) in contrast to about 10,000 degrees F for the sun. Overall, Rigel about 40,000 times brighter than our local star. Earth would need to be about 200 times farther away, or about 5 times as far as Pluto, to bear life in orbit around Rigel. Even then the light would not be the same, as much would be at higher, bluer, wavelengths. Counting all its radiation (not just visible light, but infrared, ultraviolet and so on), Rigel is 66,000 times more powerful than the sun. With such enormous energy, you might be surprised to find that it has only 17 times more mass, and 70 times the width, of our sun. Yet Rigel is not one of the galaxy’s largest stars, as the great video above, by Jon S. on YouTube, shows. 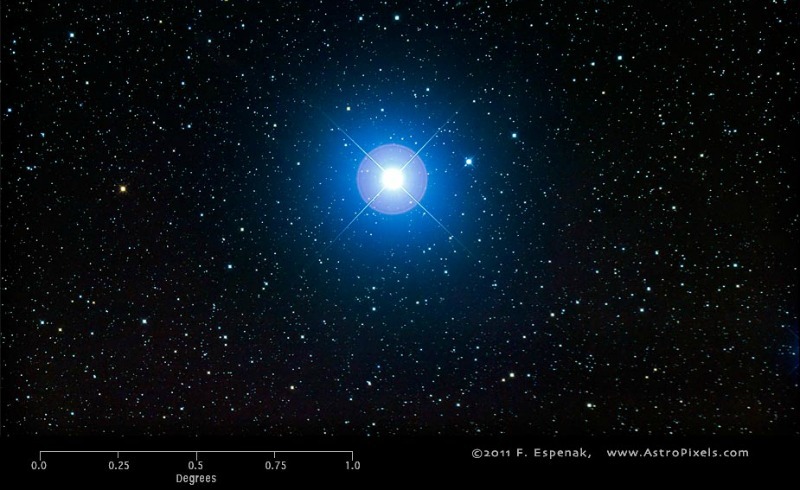 At magnitude 0.18, Rigel is the seventh brightest star in the heavens, the fifth as viewed from North America. It is a blue supergiant star, designated as type B8Ia, some 773 light-years from Earth (by Hipparcos data). In other words, the light you may see from Rigel some spring or winter night, started on its journey a least 250 years before Columbus stumbled upon the outskirts of the already populated North America in his failed attempt to sail to the Orient. Rigel in history and mythology. Historically, the brightest star in a constellation receives the designation Alpha, the second-brightest is Beta, and so on. This system isn’t used for Orion’s star, however. Instead, the red star Betelgeuse is Alpha Orionis, and Rigel is Beta. But Rigel is the brighter star. Go figure. This deviation from standard stellar designations might be because Betelgeuse is a variable star and has been known to at least approach Rigel in brilliance. Rigel received the designation Beta Orionis from the German astronomer Johann Bayer in the early 1600s, who sought to systematize the naming conventions. It’s possible Betelgeuse actually was brighter around this time. Nowadays, Rigel outshines Betelgeuse, though. By the way, Rigel is also intrinsically brighter than Betelgeuse. If you were to put Rigel and Betelgeuse together at the same distance, Rigel would outshine mighty Betelgeuse by more than 400 percent. The name Rigel comes from an Arabic phrase frequently translated as The Left Foot of the Central One. Although Orion was depicted as a giant or warrior in many cultures, in the original Arabic it might have been reference to a black sheep with a white spot or spots. Thus in the original form, Rigel might have designated the left foot of a sheep! Now, however, many people know it as the left foot of Orion the Hunter. The mythology related to Rigel is sparse and unclear. Perhaps the most interesting connection is in Norse mythology, which sometimes identified Orion with Orwandil (also Orvandil, Aurvandil, Earendel and others). According to some, Orwandil was traveling with his companion, the god Thor, when his big toe froze in an unfortunate river-crossing incident. Thor broke off the frozen digit and threw it into the sky, where it became the star we see as Rigel. In some variations, the Orwandil’s other big toe became the faint Alcor in Ursa Major. Rigel’s position is RA: 05h 14m 32.3s, dec: -08° 12′ 05.9″. Enjoying EarthSky? Sign up for our free daily newsletter today! 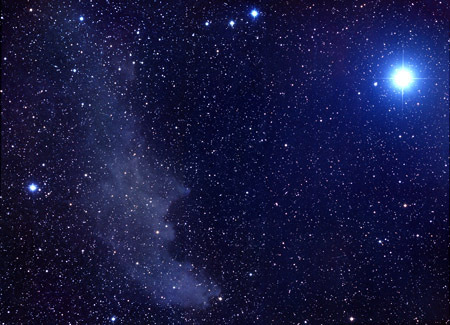 Bottom line: The blue-white star Rigel, in the constellation Orion, is one of the brightest stars in the night sky. How to see Rigel. Larry Sessions has written many favorite posts in EarthSky's Tonight area. He's a former planetarium director in Little Rock, Fort Worth and Denver and an adjunct faculty member at Metropolitan State University of Denver. He's a longtime member of NASA's Solar System Ambassadors program. His articles have appeared in numerous publications including Space.com, Sky & Telescope, Astronomy and Rolling Stone. 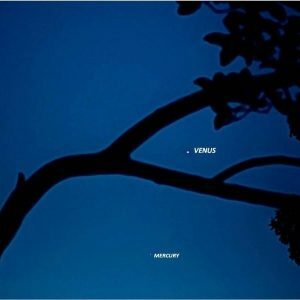 His small book on world star lore, Constellations, was published by Running Press.